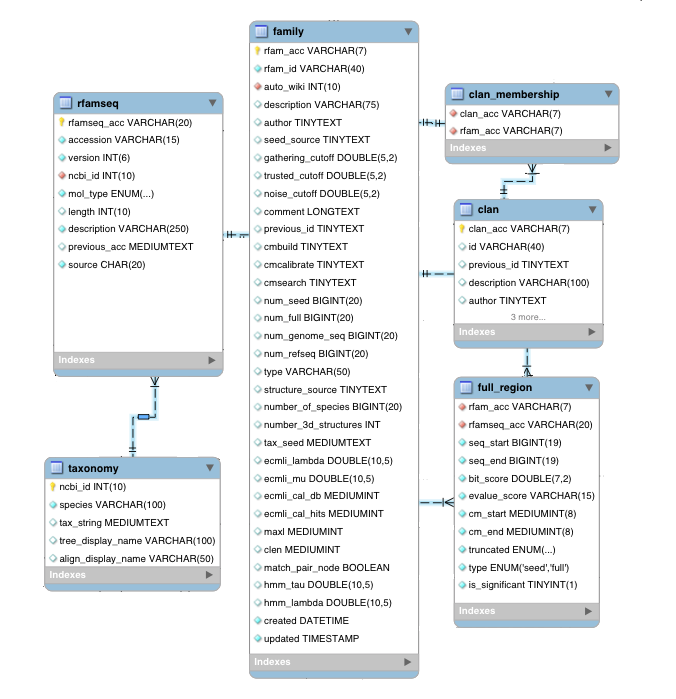 Rfam provides a public read-only MySQL database containing the latest version of Rfam data. The database will be updated with each release. To access old versions of the database download SQL dumps from the FTP archive. or use MySQL clients such as MySQL Workbench or Sequel Pro. If your computer is behind a firewall, please ensure that outgoing TCP/IP connections to the corresponding ports are allowed. rfamseq a list of all analysed sequences including INSDC accessions, taxonomy id etc. full_region a list of all sequences annotated with Rfam families including INSDC accessions, start and end coordinates, bit scores etc.